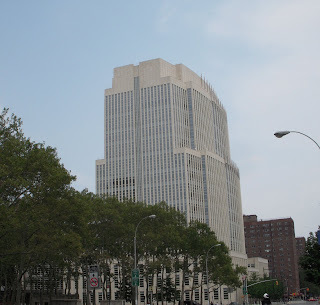 Noticing New York: What Could We Expect Forest City Ratner Would Do With Two Library Sites On Sale For The Sake Of Creating Real Estate Deals? What Could We Expect Forest City Ratner Would Do With Two Library Sites On Sale For The Sake Of Creating Real Estate Deals? As the result of a new city-wide policy making the generation of real estate deals the library system’s priority the city expects to be selling off sites to developers. See: Thursday, January 31, 2013, New City-Wide Policy Makes Generation Of Real Estate Deals The Library System’s Primary Purpose, and Friday, February 1, 2013, City Strategy Of Withholding Basic City Services To Blackmail Public Into Accepting Bigger Development. Two of the sites identified for sale in the forefront of this march towards divestiture of assets with a concomitant shrinkage of the system are in Brooklyn. Brooklyn development, especially when government officials are involved, is considered Forest City Ratner's turf, to the virtual exclusion of all others. Whether by coincidence or not, both of these sites (library sites are unfortunately city-owned) are immediately adjacent to property the government has previously put in the hands of Forest City Ratner pursuant to no-bid deals and with special terms and subsidies. When asked, Josh Nachowitz, spokesperson for the Brooklyn Public Library refused to disqualify or blackball Ratner as a future owner (again without bid?) of library properties as a result of the sell-offs toward which the system is maneuvering. That refusal is notwithstanding the fact that Forest City Ratner already has a very dangerously large government-assisted monopoly in Brooklyn and a record of failing to deliver on public benefit promises with a history of blackmailing the public to change terms of agreements. reputation for promising anything to get a deal, only to renegotiate relentlessly for more favorable terms. There is little doubt that Forest City Ratner will be interested in acquiring the two library properties adjacent to its own, one where Brooklyn Heights borders Downtown Brooklyn, the other where Boerum Hill borders the Ratner malls, “Barclays” arena and the rest of the Ratner Atlantic Yards mega-monopoly. It may even be suspected the firm will have the inside track if for no other reason than that the firm specializes in government relationships and the spoils of crony capitalism and city officials will be heavily involved in the disposition. Therefore it is worthwhile to ask what Forest City Ratner would be likely to do when it acquires these two library properties. Here is what Ratner is going to want to do. Rendering of the potential Ratner "Mr. Brooklyn"
The Brooklyn Heights Library site being sold on at 280 Cadman Plaza West (at the corner of Tillary Street) is three short blocks (.3 miles) from 285 Jay St, (at the corner of Tillary Street) the site where a few years ago, the last time the real estate market was healthy, Forest City Rater planned to build “Mr. 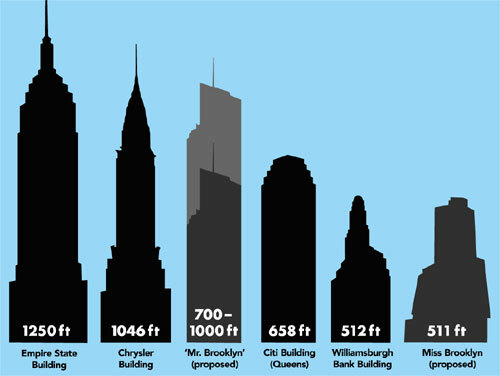 Brooklyn” (his “second attempt to build the tallest building in Brooklyn”), a potentially 1000 foot high “spire.” See: December 1, 2007, Mr. Brooklyn, by Adam F. Hutton, The Brooklyn Paper. • Secrecy is nothing new for Ratner. 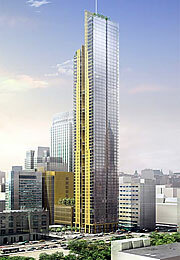 • The Ratner spokesman’s renunciation of the rendering shrouds the project in additional secrecy. How large a building could Forest City Ratner build on the Brooklyn Heights library site? The library system representative describing the envisioned deal to the Brooklyn Heights community this past week represented that no rezoning of the site is necessary for the site to be redeveloped, saying that the FAR* for the site was 10. The zoning for the Brooklyn Heights library site (C6-4) currently has an FAR of 10 (for a residential equivalent of an R10, the highest density residential district), which is fairly high, but it could be increased still further, something a developer would be interested in seeing happen. A bonus, taking the permitted FAR up to 12 is available if, for instance, some of the existing open space on the site is preserved as a public plaza. That’s obviously an FAR higher than the public was told at the meeting last week. In addition, because there would be a condominium unit for a small library in the new building (a community facility), the entire permitted structure could be bigger than normally permitted under that R12 FAR standard. 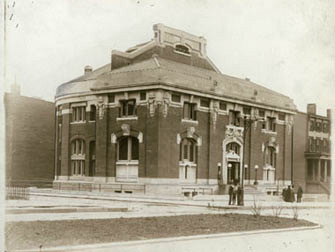 The library was constructed as part of an urban renewal plan. The fact that arguments could be made that aspects of that plan still pertain could potentially throw in wild cards in terms of figuring out what is actually permitted, whether it be more or less. Finally, the permitted FAR could be increased by obtaining a zoning change for the site something the developer would likely seek after it contractually locks in control of the site. To avoid such a change being considered an illegal “spot zoning” change that might involve an upgrade of the entire (rather small- see map below) C6-4 district, which could have the effect of allowing Ratner to transfer unused FAR zoning rights from his adjacent site to the library site. The library system spokesman last week said that there were no development rights the library could transfer to an adjacent site: He did not say that development rights couldn’t be transferred to the library site. Might a 74-711 transfer of development rights be possible from any of the historic landmark buildings in Brooklyn Heights? At this time I can’t tell you. The library site ending in a narrow triangular tip is not in all respects that easy to develop for other uses. Concern about how elevator and utility cores will be accommodated may be one reason those formulating this plan want to downsize the current library space from 62,000 to 16,000 square feet. (Another reason for them to want to downsize the library is to de-accentuate the perception of how much money is being spent to just to stay in the same place: In other words, the amount being spent to demolish and the reconstruct the library. That's all profit for the developer but not the community. Anyone who says the library somehow comes "free" is wrong) The difficulties posed by the site’s triangular shape might cause the developer to seek variances to achieve the maximum size building that can be built. Would all of this allow Forest City Ratner to achieve on the acquired library site, something equivalent to the potentially 100-story “Mr. 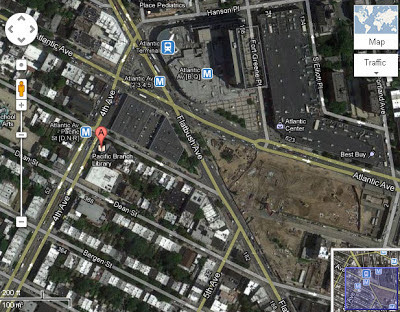 Brooklyn” it was planning only few blocks further east on Tillary Street? That’s unlikely, but zoning is complicated to figure out. 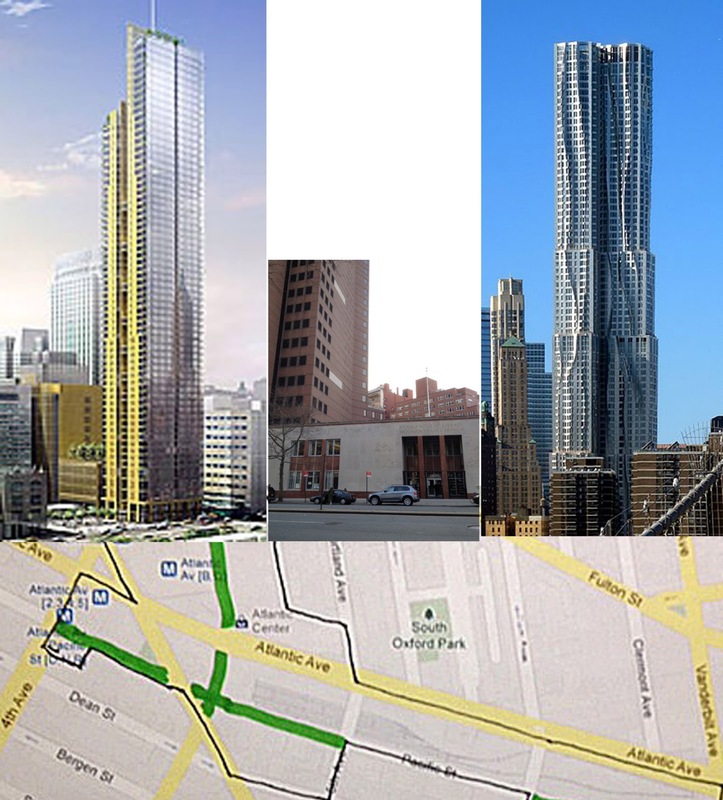 I don’t have enough information or professional expertise to know exactly how tall a building could be managed, but I also can’t tell you how Forest City Ratner planned to make Mr. Brooklyn 100 stories tall (it was also in a C6-4 zoning district, see map above) and I can’t tell you exactly how (other than political connections) Forest City Ratner managed to make its Gehry-designed 8 Spruce Street, crammed into the financial district on the Manhattan side of the Brooklyn Bridge (with a school in the bottom, similar to this library plan and the Mr. Brooklyn plan), 76 stories tall and thus the tallest residential building in the Western Hemisphere (image from Wikipedia's Wikimedia commons on right). It did involve transfer of development rights: That Spruce Street tower, next to what is only an R8 residential district, is also in a C6-4 district just like the Heights library site, see the segment of the zoning map above- exact project location indicated in Google map below. When Josh Nachowitz was speaking at last week's public meeting he did not answer the question of how tall a developer would build the building replacing the library building on the Heights site as if he did not know the answer. I have been informed that, off the record, he has told others in internal discussion the building could be forty stories plus parking below. That height, tall enough to generate harbor views by soaring above the rest of Brooklyn Heights, would be without the transfer of additional development rights. The price the city would be paid for the land (the money received goes to the city, not to the library system) would be based on those forty floors, not what the developer might finagle to add to it with transfers after the fact. Would the underground parking be joined with the underground parking in the adjoining Ratner building? That's likely. People should talk to the librarians to get the gossip about what isn't being said to public. I have already written noting Michael Kimmelman's astute characterization that the poor souls in the library system that is being starved by the Bloomberg administration seem to be suffering from a form of “Stockholm syndrome” in assessing the choices with which they are being presented: They are starving now but if the deal goes through they could have a shiny new facility (albeit smaller). At the same time librarians who do not now have private parking spaces are being told they will be given them if the plan goes through. 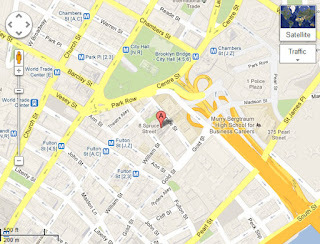 In New York City parking spaces are worth around a quarter of a million dollars apiece! : A few of them quickly add up to the cost of the repairs said to be currently needed. Librarians may want to lawyer up so they can be told that a statement by Josh Nachowitz that they will be given a personal parking is not legally enforceable. One thing to note: The building on the library site would be much taller than the Cesar Pelli & Associates-designed federal court house just across Cadman Plaza or even the height it might have been. It wound up shorter than allowed and planned after it was was challenged in court by community residents and was scaled back to 14 stories from the 18 originally planned. I've said that in that case I believe the building should have been built according to what was originally planned. 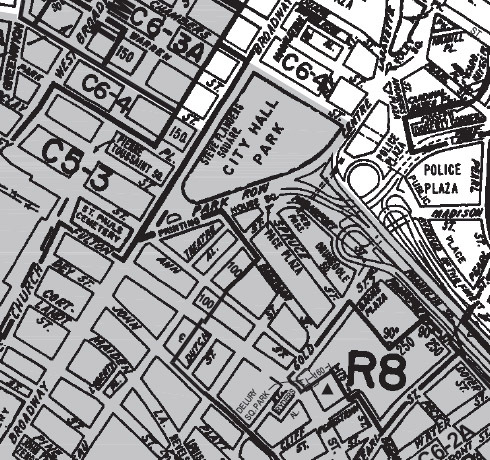 Looking at the zoning map above you'll see the zoning for the site is R7-1, less than for the library site. On the other hand, much of what Forest City Ratner has done in pushing the envelope has been preposterous and offensive to community standards, but Forest City Ratner has nevertheless been supported in these exploits by powerful organizations (organizations getting Ratner financing) like the Brooklyn Museum and the Brooklyn Academy of Music, thus canceling out community opposition. If Forest City Ratner acquires the site of the Pacific branch library it can extend its contiguous multi-acre Atlantic Yards empire and cheaply obtain extra benefit by also acquiring and closing down a new section of Pacific Street so as to connect the former library site to its contiguous Atlantic Yards acreage. Close down another city street? Why would the Ratner organization do that and how they be arguing that it makes sense? 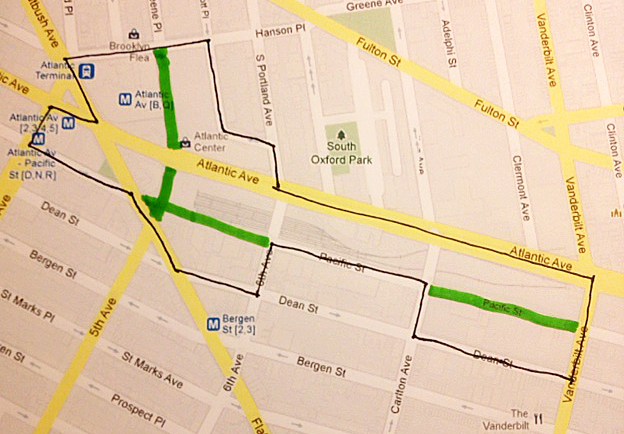 Forest City Ratner has a long history of obtaining private ownership and closing down public streets. 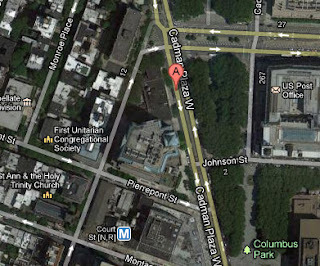 It is one reason the traffic configurations around the Ratner Metrotech are so odd and difficult. Most of the formerly public streets right around this section of Pacific Street are already closed down and privately owned by Forest City Ratner (see map above). 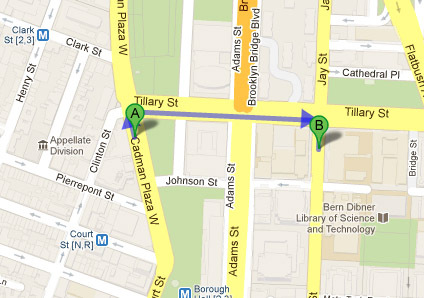 If all of Pacific Street between the Ratner-owned block on which you can find Modell's and the block on which the library now exists were shut down and given to Ratner by the city it would be roughly the equivalent of the length of Fort Greene Place also spoking off from the Ratner (Prokhorov) arena, in that case just to the north. Since Pacific Street no longer exists where it once did (where the “Barclays” arena has replaced it) there is a good argument that a public street leading up to the no longer existing street is not needed. The philosophy expressed in the Atlantic Yards design is that superblocks are good. This would extend that practice to create one more similarly sized adjacent superblock. 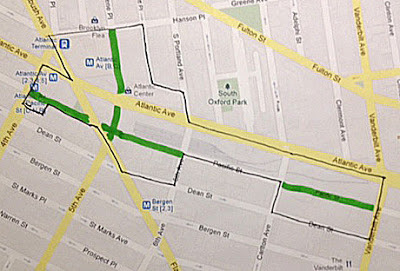 The privatization of the street could be accomplished exactly the same way that the streets in the Atlantic Yards footprint were privatized: The state’s Empire State Development agency ("ESD," formerly UDC) could condemn them and New York City could accept a token condemnation award that Ratner would pay it for the land, far less than the real value of the streets. So that Ratner could get the maximum benefit, the entire length of Pacific Street between 4th Avenue and Flatbush would be privatized. Since, for the time being, there are still private properties fronting on some of that length of Pacific Street the owners of those properties would be granted an easement for ingress and egress over the Ratner-owned street. The advantage of all of this would be to give Ratner extra rights in terms of increasing the maximum density at which he can legally build within his 30+ acres of mega-monopoly. ESD's involvement extending the boundaries of the Atlantic Yards district would also serve to override normal zoning protections. If this sounds absurd remember that this is precisely what was done on a large scale when developer-formulated Atlantic Yards was assembled. Do the boundaries of things like government urban renewal districts get adjusted after the fact to include properties developers set their sights on? : That's exactly how the current boundaries of the Atlantic Yards footprint wound up being drawn to Forest City Ratner's specifications. Forest City Ratner should be giving back to the public the streets that were privatized and turned over to it. So far public officials are not requiring this. . . . If we are not having the conversations we should be having about why Ratner should be forced to give back the portions of Pacific Street he took before and even now is not making any real use of them, what is to stop Ratner from going on the offensive once again and seek the closing and private ownership of even more of Pacific Street? For instance, the current New York City Public Advocate, Bill de Blasio, who rose in Brooklyn politics as a local city council member (for the 39th District) and therefore ought to be sensitive to local community concerns, has now served almost his entire four year term as Public Advocate without ever lifting a finger to call for the restoration to the public of those parts of Pacific Street that the Ratner organization, having reneged on original representations, isn’t actually truly using and won’t be using for many years, probably decades. Why not? There is, after all, ample precedent for restoring privatized demapped streets to the public when they are part of vacant sites and it is realized that the original demapping was ill-conceived. This does not bode well: Bill de Blasio is now running for mayor. 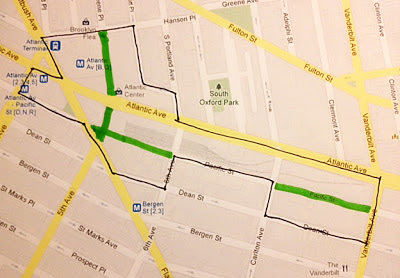 Since he is not taking the public’s side on this issue now as Public Advocate it is entirely conceivable that he would, as mayor, similarly turn over more of Pacific Street to Forest City Ratner. (Mr. de Blasio has offered no indications of where he would split from real estate developers to support the interests of communities.) Christine Quinn, who has been running the City Council as its speaker has been a straight down the line implementer of the Bloomberg administration's real estate policies so it can be expected that, by continuing them, she would wind up doing exactly the same thing in the future in terms of Ratner's continued privatized ownership of streets. Would Ratner be impeded, unable to grab control of the library sites, due to lack of funds having fallen on the financial ropes as a result of multiple bad decisions respecting Atlantic Yards and the community's wised-up opposition? There won't be financial hurdles so long as Ratner can readily access mufti-millions from Chinese EB-5 investors buying green cards or Russian oligarch Mikhail Prokhorov. What I have written here may seem almost like no more than an improbable satire except that everything I have said might happen accords so closely with what politicians in this city have already participated in making happen, many examples of it involving Forest City Ratner’s pushing the envelope of politically connected developer privilege. There is consequently absolutely no assurance that any of the possibilities I have spelled out here won’t materialize. What would prevent it? A vigilant, demanding citizenry who we may hope can demand accountability and action from our politicians. . . The best test of what we can expect from our politicians in the future is what we can succeed in demanding from them today. . . A good starting demand? A loud outcry to take the governmentally-assisted Brooklyn mega-monoply away from Forest City Ratner and end its current abuses. PS (added February 9, 2013): The following recent article (with links to others) that ends with a link to a petition to stop the defunding and skrinkage of the library system for the sake of creating real estate deals: Saturday, February 9, 2013, Libraries That Are Now Supposedly “Dilapidated” Were Just Renovated: And Are Developers’ Real Estate Deals More Important Than Bryant Park?